7-Week, 6 day/week sport-specifically designed to prepare athletes for the fitness demands of 160th SOAR (A) Green Platoon Assessment & Training Course. 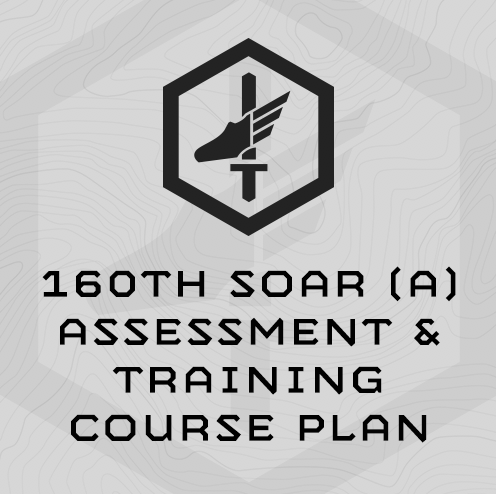 This is a sport-specific 7-week program is specifically designed to prepare athletes for the U.S. Army 160th SOAR Green Platoon Assessment & Training Course. The plan includes a 1-week taper, and is designed to be completed the 7 weeks directly prior to your Green Platoon start week. This is a very intense, 6-day a week training program with high levels of volume and stress. Be safe and smart about your training as you work through the program and don’t be afraid to cut down sessions, or if necessary take an extra rest day if needed. This program gets progressively harder each week, until week 7, when the training tapers down into the start of selection. Don’t skip ahead!! The plan is designed to build upon itself. If you have to miss a training day, start up back where you left off. Testing and progressive training for the APFT events (run, sit ups, push ups) plus pull ups. The plan includes 42 Total Training Sessions. It is intended that you’ll train Monday-Thursday with a long ruck on Saturday. Friday and Sunday are rest days. The plan includes 4 specific assessments, and follow-on progressions. You’ll take these assessments three times over the7 weeks – beginning, middle and end. The progressions are percentage based from your assessment results, automatically scaling to your current level of fitness. → 30% of 50x Sit-ups is 15 (3. x 50 = 15). Set a repeating timer for 75 seconds. through 15x sit-ups again for Round 2, rest the remainder of the interval, etc. through 6 Rounds. The training plan includes scaled paces for your runs and rucks. These paces are based on your assessment results from the 8-Mile Ruck, 2-mile APFT run, and 6-mile run. You’ll take these assessments 3 times throughout the plan. Use your latest assessment results for the subsequent training sessions. We use interval training to train your run and rucking speed. The interval distances are shorter and pace faster than your latest assessment pace. You’ll use the MTI Running Calculator and Ruck Calculator to find your interval pace for the assigned distance. Use this training plan to get your rucking dialed – including boots, pack loading (weight high instead of low seems to help), pacing, nutrition, and hydration dialed. Ruck in the same boots you’ll take to selection. Refuel the same way you’ll refuel at selection, etc. One tip for the Rucks – Run 3 Minutes, Walk 3 Minutes can help you keep on pace. Also, work to increase the frequency of short strides to increase speed, rather than stretching out your stride. What if I have less then 7 weeks before I start the Selection Course? Still start at the beginning of this training plan anyway. Skip ahead to Week 7 in this plan the week directly before Selection begins in order to deload. Building stamina and resilience is a key training goal of this plan, and physical and mental stamina is also key to completing the Selection course. If you can’t handle the training volume at first, it’s better to cut training sessions short, rather than take unscheduled rest days. What Does 5x Sandbag Getups @ 40/60# Mean? Women use a 40# sandbag for their getups, and men use a 60# sandbag.